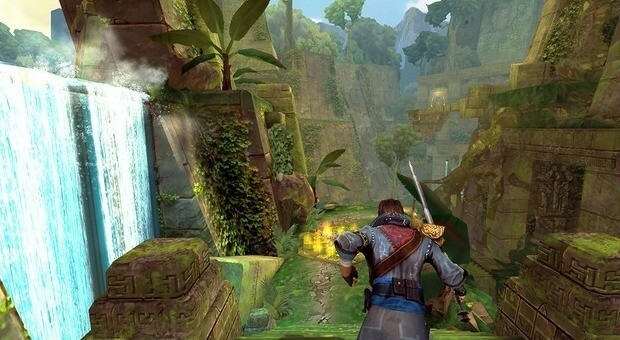 Stormblades is a stripped-down version of Infinity Blade, but that does not mean the gameplay is not as exciting as the original. Its brilliance lies in its simplicity. Fight monsters, collect essence, upgrade weapons. Rinse, repeat. However, you will need to master some tactics if you want to slay giant monsters. Follow these tips and tricks to become the ultimate Stormblades warrior. Probably the best counterattack against your enemies. Remember that most giant monsters are a bit slow-paced, so you can easily detect which direction their sword will swing. If the enemy swings sideways from left to right, swipe right. If the monster swings down, swipe up. However, keep an eye on tricky swings, especially swings in the diagonal direction. Observe the direction and parry accordingly. Make sure that you take at least two life stones with you while going out to battle. When your health’s low, tap on the life stone icon on the bottom left corner of the screen and quickly swipe in any direction. You will notice your enemy’s health will drain much faster than ever before. This will happen for a few seconds, so be quick and make the most of these moments. You gain 20 points for removing one armor piece. When a giant is down, swipe fast to break it. Removing armor has its own benefits. The enemy’s health bar will decrease rapidly. Blood drains slower when enemies are armored up. Focus on gloves, helmet first as they can be broken easily after a series of quick swipes. Once they are broken attack them to drain health quickly. Essence plays a key role in upgrading your sword. You will also need it to purchase life stones. One life stone costs around 200 essences. The best trick to earn them is to play previous levels. You will encounter the same deadly monsters but it will be easier to kill them than it was in the first attempt because you will be using an upgraded weapon. When you approach an enemy, the camera slows down a bit, giving you enough time to perform a parry. Once you are successful in your countermove, anticipate his next move and act accordingly. If you are successful in defending his attacks in these few moves, you will get an opportunity to attack him. Swiping in the direction of a blue or red arrow triggers a power strike. Don’t miss this opportunity and act immediately once you see such arrows. Not only you will inflict a critical hit, but also earn extra points. Such arrows appear quickly and almost randomly, so keep an eye on them and go for the kill. Each villain has a unique magic attack spell, which won’t be easy to deflect. You will need to dodge their spells. Double-tap the screen to move away from such attacks. Soft, quick double taps should do the trick. You just need to tap twice because tapping multiple times won’t make your character move away from the enemy. P.S. I noticed a slight delay in dodging enemy attacks when your tap twice. Hope the next update fixes this problem. This is a no-brainer, but in several occasions you may forget to upgrade your sword. Choose the right weapon from the vault, and if you have enough essences, just use them to level-up your weapon. Once upgraded, use it to replay previous levels to collect more essence. Rinse and repeat to max out your upgrades before heading out to battle. However, make sure you save some essence to purchase life stones.